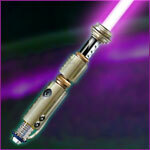 The construction of this prop was much more complex than the other lightsabers of Episode IV: A New Hope. 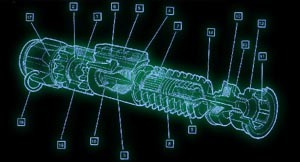 First is the blade emitter which has yet to be identified. It could be some type of gas burner or a rosebud type torch tip used in sheet metal work. On the opposite end of the spectrum it could even be a piece for fire suppression equipment. An early theory was a sink drain for a vanity or bar likely made by a European manufacturer. 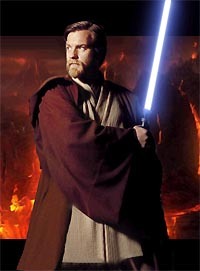 Obi-Wan Kenobi was a committed and extremely legendary Jedi Master who had an extensive and chaotic career that has helped determine the fate of an entire galaxy. At 25 years of age, he was caught up in the important events in Naboo which led to the very first battle that can be considered for the Clone wars. At the time he was an apprentice of Jedi Master Qui-Gon Jinn. At the command of Supreme Chancellor Valorum, Obi-Wan and his Master furtively voyaged to Naboo to negotiate a peaceful settlement to the tense Trade Federation blockade of the planet. Aboard a Trade Federation vessel, the scheming Neimoidians sprung a trap on the Jedi, and attempted to kill them. Kenobi and his Master escaped and stowed away on Trade Federation invasion craft landing on Naboo's surface. Obeying his Master, Obi-Wan voyaged from Naboo to Coruscant and back during the intrigue that surrounded the Battle of Naboo. When Qui-Gon Jinn brought a freed young slave boy, Anakin Skywalker, before the Jedi Council, Obi-Wan was taken aback. Qui-Gon claimed that Anakin was the Chosen One of an ancient Jedi prophecy, and that he was to be Jinn's new Padawan learner, replacing Obi-Wan. The council refused Jinn's proposal to train the boy. This was just one of many arguments that Obi-Wan Kenobi and Qui-Gon Jinn had during their time together. Jinn, a proponent of the living Force over the more serene unifying Force, had long been a maverick in the eyes of the Jedi Council. Obi-Wan implored his Master not to go against the Council, but Qui-Gon always responded by saying that he must do as the will of the Force advises. During the liberation of Naboo, Qui-Gon and Obi-Wan were challenged by a deadly Sith Lord. A forgotten menace, the Sith had returned after centuries of seeming extinction. For the first time in ages, Jedi and Sith dueled. 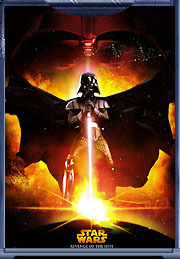 The dark warrior, Darth Maul, used his incredible speed, rage and his double-ended lightsaber to fend off both Jedi. As the duel progressed, Obi-Wan and Qui-Gon became separated. Kenobi watched helplessly as Maul killed Qui-Gon, and he rushed to kill the Sith Lord in turn. Qui-Gon's dying words were a request for Obi-Wan to train Anakin, despite the Council's objections. The Council eventually agreed with Obi-Wan taking Anakin as a Padawan -- though Jedi Master Yoda had strong reservations about it. The Council also bestowed upon Obi-Wan the title and rank of Jedi Knight. For over a decade Obi-Wan guided young Anakin on the path to Jedi Knighthood. Having to rein in an adventure-seeking youth made Obi-Wan wise -- and cynical -- beyond his years. True to his role, Obi-Wan recognized both Anakin's strengths and weaknesses, and he tried to impart his lessons with the patience and understanding that his mentor, Qui-Gon, did. As Anakin progressed, Obi-Wan grew increasingly concerned that the young Padawan's raw power had fostered a dangerous arrogance. He frequently expressed these reservations to the senior members of the Jedi Council, but they continued to trust in Kenobi's mentorship. After returning from a border dispute on the world of Ansion, Obi-Wan and Anakin were called by the Supreme Chancellor to protect the life of Senator Padme Amidala. Though Obi-Wan carried a less-than-favorable impression of politics, he nonetheless took the assignment very seriously. A failed assassination attempt left Obi-Wan with a valuable clue -- an exotic weapon not recognized by the analysis droids of the Jedi Temple. As Anakin voyaged off world on his first mission, escorting and protecting Padme Amidala on her home planet of Naboo, Obi-Wan continued the investigation. He journeyed to Coruscant's Coco Town, a shabby stretch of city where an old friend, Dexter Jetsetter, lived and worked. Dex, the proprietor of a simple diner, was a wealth of knowledge, and was able to identify the weapon as a Kamino saberdart. In searching out Kamino, Obi-Wan discovered a dangerous and disturbing mystery. The vaunted Jedi Archives, perhaps the largest repository of lore in the galaxy, had no record of the planet that Dex described. Conferring with Yoda, Obi-Wan learned that Kamino had been erased from the archives. Aboard a Jedi starfighter, Kenobi journeyed to the storm-shrouded world of Kamino. There, he made contact with the Prime Minister, Lama Su, and the mystery surrounding the planet became even more tangled. As explained by the Kaminoans, Obi-Wan were expected. A decade prior, the Kaminoans had begun crafting an immense clone army on the behalf of the Jedi for use by the Republic. Jedi Master Sifo-Dyas, believed dead at the time, had apparently commissioned the army. The courteous Kaminoans gave Kenobi a tour of their cloning facility in Tipoca City. Obi-Wan saw hundreds of identical clone troopers, training and preparing, encased in modern, white armor. This seemed to have nothing to do with the assassination attempt on Amidala, until Kenobi met with the original genetic template for the clones. Jango Fett, notorious bounty hunter, had called Kamino home for a decade. Obi-Wan, never breaking his cover story of inspecting the clones, had a brief yet tense conversation with the hunter. Kenobi recognized the man's armor from the assassination attempts on Coruscant, and was tasked by the Jedi Council to take Fett into custody for questioning. his resulted in a fierce brawl between Kenobi and Fett. Jango Fett's weapon-covered suit aided him in landing blows on the Jedi, and the bounty hunter also benefited from cover fire from his young son, Boba. Eventually, Jango escaped aboard his starship, Slave I, but not before Kenobi was able to secure a homing device to his ship. Kenobi shadowed Jango to the ringed world of Geonosis before he was discovered pursuing Slave I. A dangerous chase ensued through the rocky rings of the red planet, and Kenobi's starfighter sustained light damage from a blistering hail of laser fire. Fett again thought he lost his pursuer and proceeded to land, but Kenobi continued his chase. Obi-Wan furtively landed on Geonosis, and snuck into one of its massive spire-complexes. Inside, he found a gathering of Separatist minds, including the leader of the movement, Count Dooku. He learned that Dooku was gathering the heads of the commerce guilds and pooling their military resources, making one huge army to challenge the Republic. Kenobi returned to his ship to make contact with the Jedi Council. He warned of the impending Separatist action, but his communication was cut short when he was taken captive. Held in a Geonosian dungeon, Kenobi was approached by Dooku. The charismatic renegade Jedi spoke fondly of Kenobi's old mentor, Qui-Gon Jinn, who had once been Dooku's apprentice. Dooku seemed to genuinely regret that events had escalated to their current level. His disillusionment with the Republic seemed sincere. Dooku even revealed to Kenobi that the Senate was under the control of the Dark Lord of the Sith, Darth Sidious. Kenobi refused to believe the words of the elder Jedi, and refused, too, an invitation to join Dooku in battle against the Sith. As per Geonosian custom, Kenobi was sentenced to be executed. Joining him were Anakin and Padme, who had journeyed to Geonosis in a vain rescue effort. The trio was chained to pillars in a massive Geonosian execution arena, and three horrible beasts were unleashed upon them. The Jedi and Padme, however, proved difficult to kill. Unarmed and shackled, they were resourceful enough to escape certain death. Kenobi avoided the deadly cutting swipes of a vicious Ackley creature long enough for Jedi reinforcements to arrive. A hundred Jedi Knights infiltrated the arena, and the Separatists countered by unleashing many more battle droids into combat. Jedi fell by the dozens, but Obi-Wan fought valiantly and survived. This was but a prelude to the start of the Clone Wars, as the newly formed Republic military stormed Geonosis. 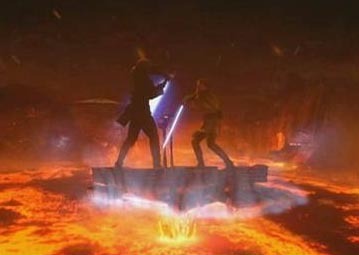 Dooku attempted to escape the battle, but Obi-Wan and Anakin gave chase. They caught up with the old Jedi in a hidden hangar. Though Obi-Wan instructed Anakin to join him in a coordinated attack against Dooku, the headstrong Padawan rushed in only to be incapacitated by Dooku's surprising dark side attack. Kenobi moved in for the attack, but Dooku proved far too powerful. 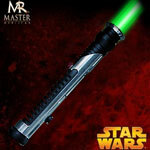 The rogue Jedi's lightsaber skills outpaced Kenobi's parries, and Obi-Wan fell to the ground, wounded in the arm and leg from glancing saber strikes. As Dooku was about to administer the deathblow, Anakin leaped forward and saved his master. Skywalker and Dooku dueled, but again the Count proved his superiority. Anakin was maimed and collapsed in an exhausted heap, joining his helpless master. Finally, Jedi Master Yoda arrived and attempted to stop Dooku. Though Yoda's withering lightsaber attack nearly stopped the evil Jedi, Dooku was able to distract the diminutive master by endangering Obi-Wan and Anakin with a fallen pillar torn free by the Force. Yoda used his telekinetic abilities to stop the pillar before it crushed the two younger Jedi, and Dooku was able to escape. Kenobi healed, and had brief moments to reflect upon the immense changes in the galaxy that had occurred. He conceded that the Jedi had needed the clone army; otherwise the Separatists clearly would have won at Geonosis. Yoda sadly noted that the victory on Geonosis was in fact no victory at all. It was only the start of the darkest times ever to be faced by the galaxy. As a General in the Clone Wars, Obi-Wan Kenobi served the Senate and the Republic heroically, on numerous historic battlefronts. Despite his misgivings, he became a seasoned starfighter pilot, learning several tricks from his unorthodox Padawan as the duo blazed a trail of victory through Separatists lines.